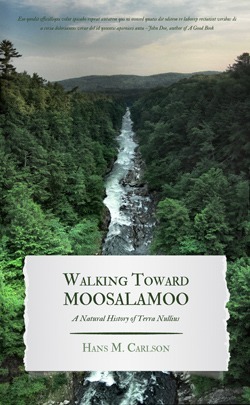 Walking Toward Moosalamoo, Hans M. Carlson’s second book, is a story of humans and the earth, as well as being a chronicle of three summers spent hiking, to a place called Mount Moosalamoo, in the Champlain Valley of Vermont. At bottom, it is an environmental inquiry into the dialog between humans and the land, one concerned with our current environmental crises, but also with the historical and cultural terrain of New England–its narrative geography. Along the way, Carlson muses on the ways we speak of the earth–how we often wound it with our words, but also how we limit our own freedom, and wound ourselves, by misrepresenting our storied relationship with the land that supports all our lives. Within, Carlson also tries to engage the long tradition of Native American thinking on this continent–the intellectual history of North America – as an answer to the questions he raises about our troubled relationship with the earth. He is particularly concerned with Indigenous understandings of words and stories–with the idea that it may not be just humans creating the story in which we all live – and a good deal of this work is trying to think about an earth who speaks. He also looks closely at America’s dark colonial history, the acknowledgment of which he calls “the price of admission” to his dialog with Native ideas. This is an environmental and political argument for listening to the earth, but also one for listening to each other. “Moosalamoo” is more metaphor than mountain, then, and the destination is a new story, not a peak in the Green Mountains. 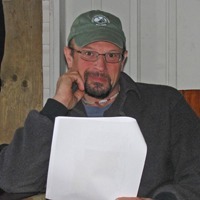 Hans Carlson is Executive Director of Blue Hill Heritage Trust, a conservation and community organization that serves the Blue Hill Peninsula, in Downeast Maine. Prior to that he was Director of Great Mountain Forest, a 6300-acre working and research forest in northwestern Connecticut, which has been under conservation for over a century. A forest and environmental historian, he holds an MA from the University of Vermont, and a PhD from the University of Maine. He has taught in the American Indian Studies Department at the University of Minnesota, and is the author of Home Is The Hunter: The James Bay Cree and Their Land. He is an avid outdoors-man, a woodworker, and boat-builder, and has traveled extensively across northeastern Canada and the United States, by canoe, truck and on foot. He was also a contributor to the Historical Atlas of Maine.